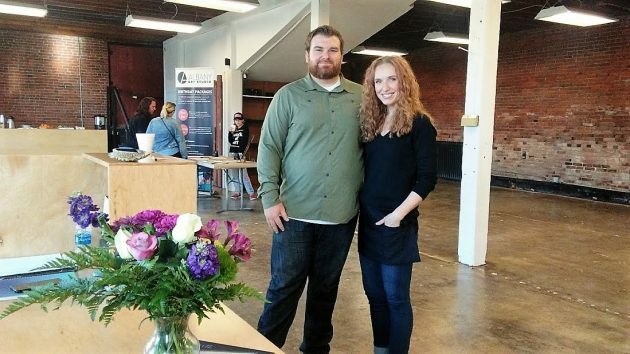 Laura and Derek Ellis inside the historic Albany Iron Works building, where Laura is starting Albany Art Studio in January. The two-story brick structure at the corner of Water Avenue and Montgomery Street is Albany’s oldest surviving industrial building. It served as the pattern shop of Albany Iron Works, which started in 1866. The foundry is long gone, but the corner structure survives. In recent memory it housed a costume business and then, for several years, an antique shop. 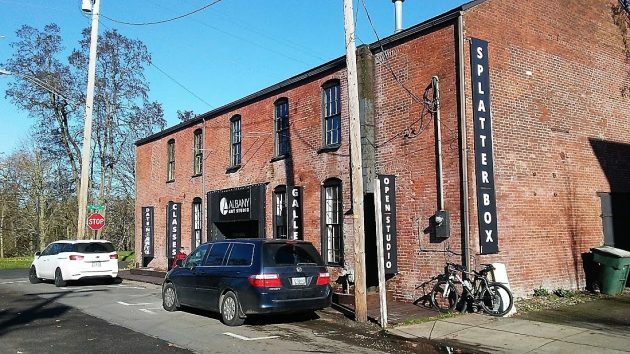 Now refurbished, the building has become the rented home of Albany Art Studio, the kind of place that Laura Ellis, once an art student at Oregon State, says she has always wanted to own and run. I met her and her husband, Derek, when I stopped by the place on Friday. Everything you want to know about the studio is explained in a stunning website Laura has built. You can find it at albanyartstudio.com. When the place opens in January, it plans to offer everything from memberships and instruction to open studio hours, occasional gallery showings, and special events, all centering on the art of painting. Big signs tell you that the old Albany Iron Works building has found a new use. That sounds like a nice re-purpose use for this cool old industrial building. I wish their new business success. Such an exciting addition to our community! And I so love that it is in the ol’ “Costume loft”! How exciting!! I’d love to see art classes provided to the community as well!